Replica of Jansky's original antenna, the first device ever to detect radio signals from space. Public domain image by Wikimedia user Astrochemist, from Wikimedia Commons. Stars and certain other astronomical objects generate light. When we look up on a clear night, we can see many thousands of stars, and a handful of other things. But light only holds a special place in the electromagnetic spectrum because we can detect it with our eyes. The things in the sky above us are not so parochial. They shine in the ultraviolet and the infrared. Some things out there produce x-rays or gamma rays. Some of them broadcast radio waves. In the early 1930s, Karl Jansky was an engineer with Bell Labs in the USA. His job was looking after the early shortwave radio transmitters and receivers that had been set up to communicate across the Atlantic. In particular, he was trying to figure out what was causing some annoying static interference with the signals. Some of it was in short bursts that Jansky discovered were being caused by thunderstorms, sometimes a hundred or more kilometres away. But there was also a more mysterious, continuous background hiss. Over the course of several days, Jansky noticed that this interference grew stronger and weaker throughout the day. It reached a maximum around the same time every day. He concluded that the radio interference was probably coming not from anything on Earth, but from the sun. He was wrong, however. Over the next few months, Jansky continued logging observations, hoping to gather enough evidence to prove the sun was the source of the mysterious interference. But the maximum level of interference didn't stay synchronised with the sun. It started appearing earlier and earlier in the day. After three months, it had drifted a whole six hours earlier. Grote Reber's dish in 1937. The first instrument purposely built for radio astronomy. Public domain image by the National Science Foundation, from Wikipedia. This stumped Jansky. He discussed the problem with his fellow Bell engineers, and with his friends. One of his friends happened to be Albert Skellett, an astronomer. As soon as Jansky described the slow drift of the maximum interference, Skellett realised that it matched not with the rotation of the Earth with respect to the sun, but to the stars. That is, the radio interference maximum corresponded to a fixed point in space, outside the solar system. They quickly checked the direction of the signal on a star map and discovered that it came from the centre of the Milky Way Galaxy. 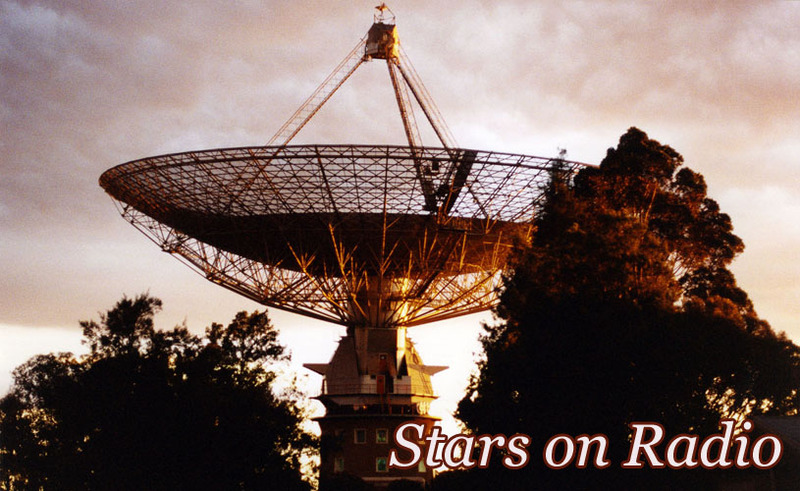 They published their astonishing finding in 1933, heralding the beginning of radio astronomy. Jansky continued working for Bell Labs, who weren't interested in astronomy, so he never got to make further investigations. Fellow American Grote Reber read Jansky and Skellett's work and found their discovery fascinating. Reber applied for a position at Bell as well, but failed to get a job there in the climate of the Great Depression. Reber dwelled on the problem, unable to do anything about it. In 1937, Reber decided to act on his own. In the four months spanning the summer of that year, he built a dish-shaped radio antenna out of wood and sheet iron in his backyard in Wheaton, Illinois. The dish was 9 metres across and could be tilted in a north-south direction. To detect specific objects in space, Reber had to wait until the rotation of the Earth brought them into the view of his dish. His first observations of the sky failed to detect anything. He tinkered with the radio frequency of the antenna and in 1938 succeeded in detecting a signal from the centre of the Milky Way at 160 megahertz. This was the first confirmation of Jansky's discovery. For nearly ten years, Reber was the only radio astronomer on Earth. He began by making a map of the sky in radio waves. He found that most of the radio emission in the sky came from our own Galaxy, aligned along the axis of the Milky Way that you can also see with your eyes on a clear night away from the lights of the city. But he also spotted two other strong sources of radio waves, roughly located in the constellations of Cygnus and Cassiopeia. Reber published his sky maps, but World War II prevented anyone else from taking up radio astronomy. After the war, in 1946, Martin Ryle was leading a group at Cambridge University's Cavendish Laboratory of physics into the new field. Their first observations were of the sun, but Ryle wanted to explore other radio sources, beyond the solar system. To do this, they needed a new type of instrument. 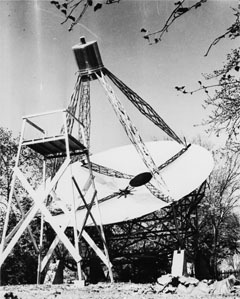 Reber's single dish had a broad reception beam, so it couldn't pinpoint the position of radio sources on the sky very accurately. Ryle and his colleague Antony Hewish designed and built a radio interferometer - a series of four dish antennae linked together. Together these produced a thinner reception beam, and allowed much more precise measurements of the location of radio sources. Cassiopeia A. False colour image in infrared, visible, and x-rays. Public domain image by NASA, from Wikimedia Commons. In the early 1950s, Ryle and Hewish mapped the sky, producing a series of catalogues of astronomical radio sources. When matched to optical observations, most of the radio sources turned out to be located within, or very close to, galaxies beyond our own. Some matched bright nebulae, known to be the leftover remnants of supernova explosions that destroyed stars hundreds or thousands of years ago. Only a handful of sources were matched to stars, and a few were in apparently blank regions of sky, with no known objects present. The object in Cygnus that Reber found turned out to be a galaxy about 600 million light years from our own, now known as Cygnus A. The object in Cassiopeia was a stronger radio source, but was in the position of an extremely faint optical object only discovered in 1950. It turned out to be a very young supernova remnant, of a star whose exploding light should have been visible from Earth some time around 1700, but which was not conclusively observed by anyone at the time. 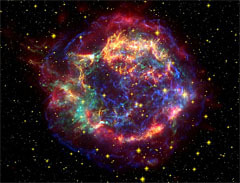 The light of both the explosion and the remnant is mostly blocked by intervening interstellar dust, but the radio waves from it are not impeded. The remnant is now known as Cassiopeia A. Throughout the rest of the 1950s and into the 1960s, the field of radio astronomy exploded, with several large telescopes of various types being built around the world. Astronomers realised they had been neglecting an enormous part of the electromagnetic spectrum, and that there was an astonishing amount of never-suspected information to be gained from observing the sky in radio waves. These observations led to the discovery of not one, but two completely new classes of astronomical object that had never even been imagined before. 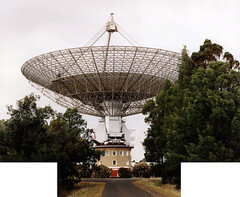 The giant 64-metre Parkes Radiotelescope in Australia began observations in 1961. A year later, it made one of the most historic observations in astronomy. The Cambridge group led by Ryle had published a third catalogue of radio sources in 1959. The 273rd object in that catalogue was in a region of sky with no obvious optical counterpart - just a scattering of very faint stars. The beam width of the Cambridge interferometer was not precise enough to identify which star, if any, was the source of the radio waves. Viewed from the Parkes telescope in 1962, this object happened to pass behind the moon. British astronomer Cyril Hazard, visiting Sydney at the time, realised this was a perfect opportunity and contacted the Parkes director John Bolton about it. Bolton agreed to the observation and Hazard hopped on the next train to Parkes. Unfortunately, it was the wrong train, and he missed the observation, but Bolton performed it for him. The only problem was that the radio source was too low in the sky for the telescope dish to point, and there was a stand of trees in the way! So Bolton had the trees cut down and then removed the safety bolts on the 1000-tonne telescope to allow it to swing to a lower position than it was designed for. Using the moon as a shutter, Bolton (and Hazard when he finally arrived and performed more observations) determined the precise location of the source by measuring when the moon blocked it out. And thus it was discovered that the 273rd radio source in the Third Cambridge Catalogue, or 3C 273 for short, corresponded exactly to what looked like a faint star. A bit of an anticlimax, you might say? Not so, for now there was a reason to take a closer look at this particular, otherwise anonymous, dim star. It is so faint that there are millions of stars brighter and potentially more interesting to study - so nobody had ever looked at this one carefully before. But now it was known to be one of the brightest hundred or so radio sources in the sky. What exactly was it? In 1963, Maarten Schmidt at the Palomar Observatory in California examined its optical spectrum for the first time, and found it to be... weird. Not just weird, but astonishingly weird. It looked nothing like the spectrum of any other star. The shape was all wrong, with a mysterious set of broad spectral emission lines that didn't match those of any known chemical elements. What was going on here? 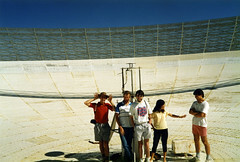 Me (right) and other summer astronomy students standing on the Parkes Radiotelescope dish. Dig those 1980s shorts. Schmidt realised that the emission lines matched those of hydrogen, but only if you moved them along the spectrum, making all their wavelengths longer by almost 16%. This is a substantial amount; increasing the wavelength of green light by 16% would make it look red. So all of the familiar features one might recognise in a stellar spectrum were substantially shifted towards the red end of the spectrum. This phenomenon is known as redshift, and there is a lot more to say about it in future annotations. But for now, redshift can be caused by objects moving away from us at extremely high speeds. The amount of redshift seen in 3C 273 means it is moving away from Earth at a speed of almost 50,000 kilometres per second; more than a tenth the speed of light. Combining this with Edwin Hubble's 1929 discovery of a relationship between redshift and distance for galaxies, this implied that 3C 273 was not a star at all, but was instead one of the most distant galaxies known at the time. Furthermore, to be so bright in both the optical and radio spectra at that distance, it had to be the most luminous object ever discovered. And so radio astronomy led directly to the discovery of quasars - extremely distant galaxies with extremely powerful visible and radio emissions. It took decades to unravel the mystery of how such objects can exist and what produces such massive amounts of power within them. We now know they are powered by extraordinarily massive black holes, a type of object theoretically predicted but still under debate in the 1960s over whether they could really exist or not. And that's just one of the astounding new things that radio astronomy discovered. The other is more fascinating still. And I'll tell its story another time. Grote Reber, by the way, continued his work in radio astronomy, but never took a job with any of the big radio observatories that sprung up in Britain, the United States, or Australia in the '60s. He in fact moved to Tasmania, where he built a house with his own hands, and built more small radio telescopes to examine the southern hemisphere skies in radio frequencies that the big observatories were neglecting. For the rest of his life he worked essentially as an amateur astronomer, funding his own research, but making discoveries that continued to contribute to our understanding of the universe and our place in it. Reber died in 2002, aged 91. His body was cremated, then the ashes were divided into 24 parts. These were presented to all of the major radio observatories around the world, and interred in memorials in nine countries. A simple analogue, good enough for today: Redshift is similar to the effect you can hear when a moving object is emitting a sound - say a police siren. If the police car is moving towards you, the siren sounds shifted to a higher tone, and if it's moving away from you, the siren sounds shifted to a lower tone. The lower tone is a lower sound frequency (a longer sound wavelength), and the same sort of thing happens with light. Objects moving away very fast have their light shifted to a longer wavelength, which is redshift. This is an extremely simplified statement of what Hubble discovered. There is much, much more to it than that. But that's a story for another day. I actually started writing this annotation intending to tell that story, but the history leading up to it was too fascinating and detailed to gloss over quickly, so I decided to do it a bit more justice first. Last Modified: Saturday, 15 February 2014; 15:47:28 PST.